Adaptive Lock is an interactive assistant for manual trading, which minimizes the losses at any movement of the price against the trader and allows the profit to grow when the price moves in the right direction. Any manual trading strategy can be used. The adaptive position locking algorithm implemented by Adaptive Lock can be used instead of stop loss for any order, including manually opened ones. 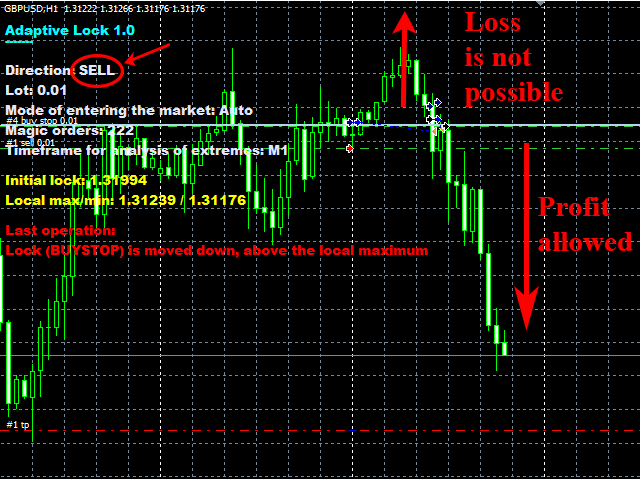 Place the initial lock line instead of the conventional stop loss. The robot monitors the price action relative to this price. If the price moves against the trader, the robot locks the position with an opposite order, which limits the losses similar to stop loss. But it is better than stop loss, as it allows not losing the position at any, even excessively large movement of price towards the loss. A timely closed lock allows returning the lost capital at the consequent return of the price to the initial level, and also lets the profit grow as the price moves in the direction of profit. The robot provides all functions for managing the locking near the level defined by trader, minimizing the losses during unfavorable price movements. It automatically opens up an opportunity for the profit to grow while the price moves in the right direction. Language - language of the messages (English, Russian). Direction - direction of the main order (BUY/SELL). Take profit of the main order - take profit of the main order (points), 0 - not used. Mode of entering the market - market entry mode (Auto/Manual). Magic (only for the "Auto" mode) - magic number for orders (only for market entries in the "Auto" mode), 0 - work with orders without the magic number (placed manually). Timeframe for analysis of extremes - timeframe to analyze the extremums (not connected with the chart timeframe). The robot works on all currency pairs and timeframes on accounts with 5 and 4-digit quotes without reconfiguring or optimization, you can set any lot value. Initial deposit is $10 or higher. The robot can place the main pending order and the initial lock line (when the Auto market entry mode is selected) or wait for the trader to place an order manually (the Manual mode). You may use a pending or market order without stop loss as the main order (a lock will be applied instead of stop loss). In the Auto mode, multiple robots can work in the same terminal if different values of Magic are set. If the robot is used for protecting manually placed orders, Magic must be set to 0. In this case, only one robot and one order can be used in the terminal. When the main order becomes a market order, the robot places a pending lock at the level defined by the initial lock line. 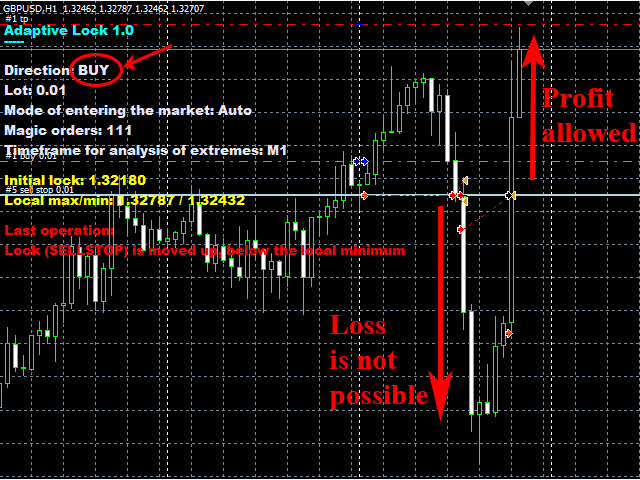 When the price moves in the direction of loss, the locking order becomes a market order and keeps the loss from growing. The price may pass any distance in the distance of loss, but the loss will not increase. When the price returns to the initial lock level, the robot closes the market lock and places a protective pending lock, which allows returning the funds from the drawdown and continuing to receive profit as the price moves in profitable direction. When the price fluctuates about the placed initial lock line, the robot applies a special algorithm to cut the losses and moves the lock beyond the local extremums of the price chart near line. Positions of orders and the initial lock line can be manually adjusted at any stage of trading, regardless of the strategy. Once the main order is closed by take profit or manually, the robot automatically closes the lock. The initial lock level should be placed at a level, where the stop loss would be placed according to the manual trading strategy. However, to reduce the losses of locking, it is recommended to select a level, where a flat is less likely to form. If the process of work reveals a flat at the level of the initial lock line that causes the lock to be triggered frequently, it is advisable to manually move the line beyond the flat. The video demonstrates three methods of using this robot in detail. For any questions please send me a private message. I will be glad to help you. Very happy with this one. Great EA for everyone using a Trend following or Reversal Strategy! A normal Stop Loss is hard to set. A stop loss too tight will be triggered too often in many cases, a stop loss to wide whereas often risks too much money and could lead to a bad Risk/Reward ratio. In addition Banks and even some Market Maker Brokers like to hunt your stops to generate liquidity for their own trades or just to take some money away from you. With this EA you will be safe in most, normally dangerous spots, the market WILL maneuver you in. Moreover the author has implemented an ingenious feature which will help you to save some good money when price starts to fluctuate around the price zone where the Lock position is situated. If you are still not 100% happy with this tool, don´t worry, the author is very friendly and will always help you in any concern regarding his products, listens to your suggestions on how to improve the EA or which functions should be added and is inherently, constantly improving his tools. If you want to maximize the $$$ you earn using your strategy, buy Adaptive Lock. Sometimes it is that simple. Thank you Vadim!! Looks promising and can be very profitable with the proper money management in the right hands. Great support from the Vadim. I highly recommend the product and the customer service :). I bought this robot Sunday, it's now Tuesday and I've made the cost of purchasing the robot. I wasn't too familiar with robots so I need assistance from Vadim.....he answered all my questions and now the robot works like a charm. I have 4 orders all using the robot.....I would give it 5 stars if the manual mode worked on multiple charts and multiple positions on each chart........don't now if that's possible, but it would be nice........Also, would be great to set up future orders by date and time. It would be 100 stars then. Хочу сказать огромное спасибо разработчику! Поставил на реальный счет, очень нравиться. Хороший советник для полуавтоматической торговли.Вы принимаете решение EA сделает все остальное. Однозначно 5 звезд! Improved and optimized the algorithm of various quotes recognition. Now, you can work with quotes having 2, 3, 4 and 5 decimal places. Removed limitations for the simultaneous work of several robot instances on different currency pairs of one trading terminal in manual mode (Mode of entering the market = Manual), with orders without Magic (Magic = 0).